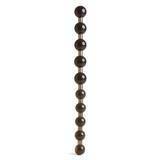 Oh me, oh my - these flexible jelly beads have a suction cup at the base and can be set it any position you like! The suction action is incredibly powerful and the jelly material is extremely soft. The beads are 2.5 inches wide at the widest point. Limited stocks at this huge discount!